From the award-winning author of Bound South comes a powerful, moving novel of family loss and sisterly redemption. For more than ten years, Naomi and Phil Harrison enjoyed a marriage of heady romance, tempered only by the needs of their children. But on a vacation alone, the couple perishes in a flight over the Grand Canyon. After the funeral, their daughters, Ruthie and Julia, are shocked by the provisions in their will…not the least of which is that they are to be separated. Spanning nearly two decades, the sisters’ journeys take them from their familiar home in Atlanta to sophisticated bohemian San Francisco, a mountain town in Virginia, the campus of Berkeley, and lofts in Williamsburg, Brooklyn. As they heal from loss, search for love, and begin careers, their sisterhood, once an oasis, becomes complicated by resentment, anger, and jealousy. It seems as though the echoes of their parents’ deaths will never stop reverberating—until another shocking accident changes everything once again. 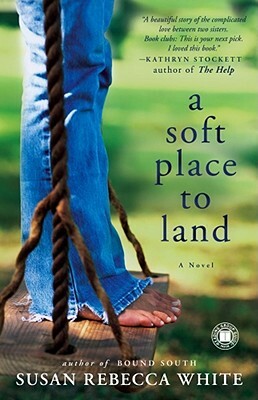 "A Soft Place to Land is a beautiful story of the complicated love between two sisters. It's smart, funny, moving and wise. I simply did not want to put it down. If you have a sister, you're going to miss her, and if you don't have one, you'll wish that you did. Book clubs: This is your next pick. I loved this book. Susan Rebecca White is a wonderful writer." "Susan Rebecca White is a true original. She whacks through stereotypes with a machete, ultimately rejecting them all, and finding instead deep compassion for the flaws that make us human. This journey of two sisters' loss and longing is sure to win your heart."